• To watch your speed. Going above the speed limit puts you at a much higher risk for accident and injury, especially when you’re on a motorcycle. • To wear a helmet that fits you. Selecting a helmet that fits your head snugly will help to reduce the risk of head injury if you should ever be in an accident. • To brake correctly. Use both breaks at the same time to slow down steadily, instead of abruptly stopping. • To be respectful of other drivers. Signal early, maintain your lane and be courteous to drivers around you. • To maintain a safe distance. Keep enough room between your motorcycle and the car in front of you to avoid an accident in case the other driver brakes suddenly. Before you even get on the road, make sure you have proper riding gear in addition to a helmet, including non-slip gloves and boots to protect yourself. To be able to get your motorcycle license in New Mexico, you’ll have to complete a motorcycle safety course. These courses teach you the basic mechanics of the bike and how to properly operate it. 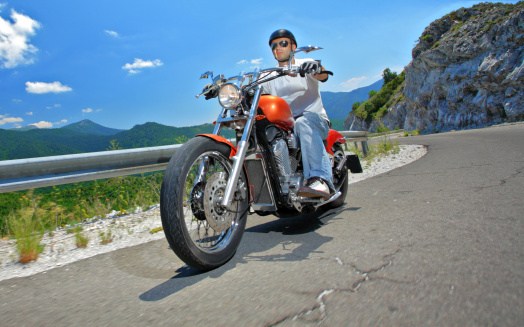 For more information about New Mexico motorcycle licenses, please visit our website!